Our mission is to provide the highest quality aluminium and glazing products and services to our clients. Our client range includes both the general public and manufacturers within the marine, automotive and original equipment industries of Australasia and abroad, including some of the biggest names in marine vessel manufacturing. Our experienced and knowledgeable team is constantly researching and developing engineering processes and improving on our approach to customer service. This commitment to innovation and quality has earned ALFAB its reputation for reliability and excellence. For over 60 years Alfab (Aust.) 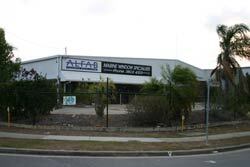 Pty Ltd has pioneered the development of window systems for many types of marine and vehicular applications. The Alfab brand is synonymous with quality. This is achieved by using experienced craftsman and high grade materials. We have QA procedures at every stage of processing to build products that will stand the test of time within some of the harshest environments on the planet. 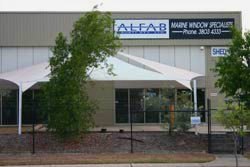 Alfab is family owned and operated in Melbourne and Brisbane whose beginnings in aluminium fabrication expanded into the marine and automotive industries through provision of standard and tailor made windows, windscreens, hatches, doors and accessories. Some of the applications for our products include various marine vessels like sailboats, houseboats and yachts and automotive vehicles including mobile homes, caravans, trucks, horse floats, emergency vehicles and earth moving equipment. The infrastructure at Alfab’s headquarters makes it possible for Alfab to achieve a flexible approach to manufacturing, which will inevitably maximise the worth that a customer receives from Alfab products. Alfab is not a one size fits all business model and we understand that different applications have different requirements. This inherent company philosophy caters to prototyping and provides the adaptability that is required for a large variety of applications. Our ability to custom make glass and a range of windows and windscreens allows us to supply craft of 10’ right through to large passenger carrying high-speed ferries. We also manufacture an extensive range of hinged and sliding doors to suit many applications. “What’s so unique about the Alfab brand is when we’re dealing with a customer, we give a customer a choice with variations of how a product can be built for them, which gives the customer the Alfab engineering advantage”. Each plant is guided by a strict adherence to quality materials, excellent workmanship and the use of computer aided manufacturing equipment. Our quality inspections ensure that our finished products conform to specifications, have moving parts that operate correctly and adhere to exacting aesthetics. All aspects of our manufacturing process are to provide you, our customer, with years of reliable service and satisfaction. In our years of manufacturing we have become specialists in the production of windows, both fixed and sliding, for all types of marine vessels including houseboats, the horse float and horse truck fraternity, motorhomes, caravans and mobile homes and large-scale earth moving machinery such as cranes, commercial forklifts, backhoes, excavator and bulldozers. Today, we supply the majority of these manufacturers on Australia’s East Coast. We have developed and extended a computer Aided Design Technology that has given us an enviable edge with regard to either original equipment or custom specification for individual or production projects. We are a “Service” oriented company and all products are quality built. We stand by them united and with an enthusiasm and professionalism that we believe is unequalled in our field. If we can be of assistance to you with any of these products or new requests please do not hesitate to contact us.